We love the combination of spinach and cheese, especially in this Keto-friendly egg casserole that only has 2 net carbs per serving. Let me show you how easy it is to make. Start by sautéing baby spinach for a couple of minutes until it wilts. I’m always amazed how much spinach cooks down. Now, before we proceed, you MUST spray your casserole dish with nonstick baking spray. Baker’s Joy is my favorite. DON’T SKIP THIS STEP!! If you forgot to spray your dish, the eggs will most definitely stick and you’ll have to chisel them out of the pan. Don’t ask me how I know. Okay, layer the wilted spinach evenly in the bottom of the sprayed casserole dish, then add the mozzarella cheesier an even layer, and sprinkle the chopped scallions on the top. In a mixing bowl, whisk together the eggs and Jane’s Crazy Mixed-Up Salt. We love this stuff. If you don’t have any, use your favorite salt blend, or just substitute salt and pepper. Carefully pour the egg mixture over the spinach, cheese, and scallions. Make sure the ingredients are evenly distributed. Cool for 10 minutes before serving. Enjoy! 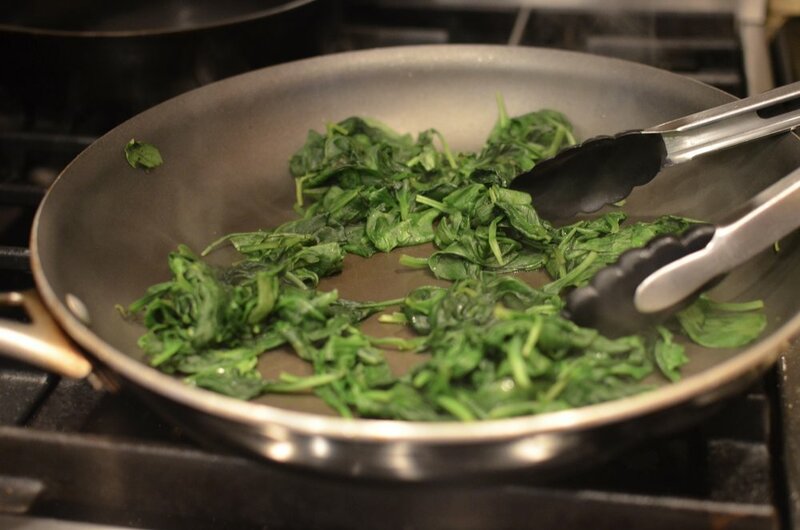 In a 12-inch skillet, cook the spinach oven medium-high heat, turning frequently, until it wilts, about 2-3 minutes. Spray a 9x13 or similar baking dish with nonstick spray. Arrange in an even layer, the wilted spinach; followed by the mozzarella and then the scallions. In a medium mixing bowl, beat the eggs together with the Jane’s Crazy Mixed Up Salt. Pour the egg mixture evenly over the spinach, cheese, and scallions (make sure everything distributed evenly throughout the baking dish). Frico (freek-o) - "what's frico" you might be asking? Frico are thin, crispy, lacey discs of cooked cheese (in this case, parmesan). Frico are often crumbled over a salad or served as an appetizer. Today I'm bulking up these delicate disks by marrying them with hard-cooked eggs - the flavor marriage of the two are perfect together. Super cool looking too, don't you think? Start by cutting hard-cooked eggs in half lengthwise. A thin, sharp knife works best (like this one). Oh hey, check out my absolute favorite method for cooking eggs with shells that release perfectly every single time, even when the eggs are freshly laid. And here's my second favorite method that works almost as well. In a nonstick skillet over medium-low heat, place little mounds of grated or ground parmesan cheese. Depending on the size of your eggs, use between 1 1/2 and 2 teaspoons for each egg half. You can substitute other cheeses if you like, but you'll have to experiment to see which ones work well. I've used pecorino romano - it works beautifully, but the flavor is stronger and the cheese is quite a bit saltier than parmesan. Carefully center one egg half on each mound of cheese. Now we wait. If any bits of cheese start jumping around in the pan, lower the heat. You don't want to risk burning the cheese so take it slow and be patient - the whole process will only take a few minutes. Remove from the heat when they look like this. Allow to cool slightly before removing from the pan. Use a very thin, flexible nylon spatula (like this one) to protect the finish of your nonstick pan. That's all there is to it - super easy. Enjoy! In a nonstick skillet over medium-low heat, divide cheese into 4 equal mounds spaced evenly apart. Top each cheese mound with 1/2 hard-cooked egg, cut side down; allow cheese to slowly melt until golden brown (if the cheese starts to jump in the pan, lower the heat).